I recommend reading both these articles (they’re cool) but the titles really convey all you need to know for this blog entry. To me, articles like these are reminders to stop and reflect on how amazing life is. Life itself is a miracle. We exist in such beautiful, wonderful complexity, and we only barely understand the physical aspects of our existence, nevermind the spiritual aspects. This fills me with awe. Sometimes it seems like scientists (at least as represented in pop culture) are too confident that we know all there is to know, or that humans know and can do better than nature. But really? It’s reassuring to see scientists looking to the world around us and realizing that there is still so much to learn. 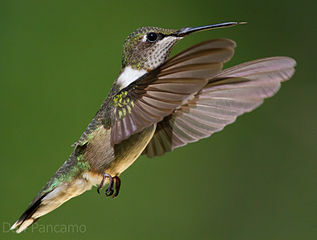 Even looking at the tiny, beautiful hummingbird, so fragile, yet so powerful, can teach us how to better build machines that can fly us around the world. Looking at the human brain can allow us to improve upon machines that can calculate equations no human brain could process without aids (if only a writing instrument and surface). Sometimes people ask writers where they came up with their ideas. Especially in fantasy, given how departed it can be from reality. And one part of the answer… I think is awe. When I witness something and am filled with awe, I am inspired. I don’t know that art can be created without awe. So what do you think? Do you think art comes from awe? Or do you think humanity can improve upon nature? Let me know in the comments, or share any other thoughts you might have.